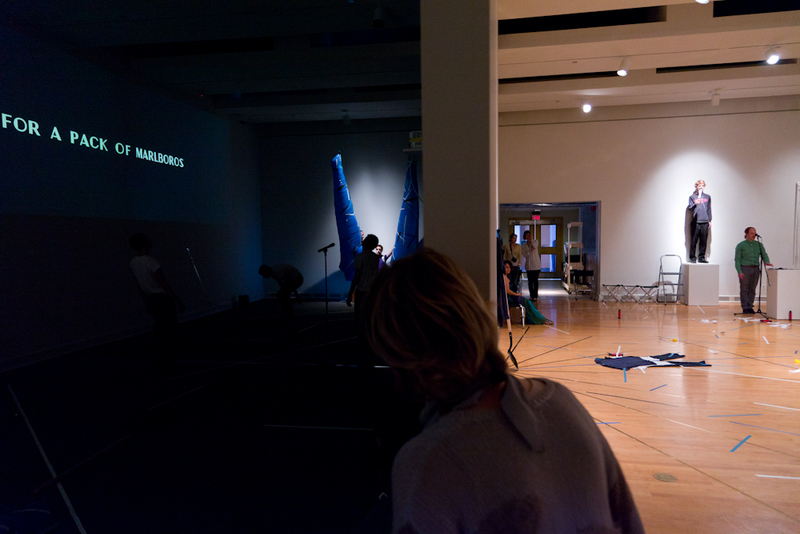 Attendants of “The Precession” on Feb. 17-18, at the ASU Art Museum, took away not just an experience but a feeling. Artists Judd Morrissey and Mark Jeffery blend otherworldly and secular references. The performers seemed to allude to the working man, while the winged figures suggested a more ethereal source. Morrissey and Jeffery began to work together creatively when they both became involved with Goat Island, a collaborative performance group based in Chicago. During that time, the artists started to forge their own collaboration, merging live choreography and large-scale digital text installations to create a strange hybrid out of the individual practices. Moved by the celestial map memorial at the Hoover Dam that Franklin D. Roosevelt dedicated in 1935, Jeffery and Morrissey decided to make a piece that responded to the engraved imprint of the stars. However, the work also presents others complexities. With Morrissey’s background in digital art and visual poetics and Jeffery’s experience in choreography and live performance, the two formed a complex piece about celestial patterns, the economy and contemporary issues. Though “The Precession” can be interpreted in many different ways, Morrissey and Jeffery offered insight into the creative process of their piece. Judd Morrissey: We started thinking about this site at the Hoover Dam, a monument to the building of it. What we did is we each responded in our own way to the site as a creative starting point. One way in which I responded was by doing some writing and then taking that writing into the computer and coding it and playing with the visuality of it. It started from that point, and it’s a very complicated trajectory. But it involves working both separately and together. Whereas I’m working on the screen-based components, Mark also develops his own interventions into the performance, so it’s an organic conversation we’re always having. A lot of the things that I do will come back and play into the physical structure of the space. Mark Jeffery: This is a piece that’s been going for four years, so we’re happy for these natural intrusions to take place. The video actually is, for here, three websites that will be simultaneously playing. There is still video integrated, which allows for Twitter within a mile radius of the museum to be pulled in. So we actually have this live data that can be charged. The way we’ve been able to keep working is through our residency and an invitation to do an exhibition we’ve been able to feed a particular piece into the main work. For the three-month exhibition we did at the Hyde Park Art Center in Chicago, we opened on the winter solstice and closed on the spring equinox. It was important that we did it those days. Why is this work called “The Precession”? JM: We visited the Hoover Dam at the time that Obama’s campaign was going and there was a lot of this New Deal type of talk. There was a different kind of spirit in the air. A lot of people were digging back into the idea of fixing the economy and putting people to work. There was a lot of rhetoric circulating around the New Deal emerging. We decided to look at that. In the celestial map that’s engraved, there is a depiction of precession, and what it is in astronomy is the fact that the sky is slowly changing so that the pole star changes over thousands of years. Right now our pole star is Polaris, but a few thousand years ago it was something else and in a few thousand years it will be Vaga. So actually over time people will see a different sky, different locations, and will have to navigate differently. It’s sort of a representation of time at a monumental scale, and the reason the pole star shifts is because the Earth’s axis is gradually increasing its tilt by one degree every 72 years. It was discovering this concept and playing with the idea of the recession within the word “precession” and the economic cycles. The word has also been used in a lot of other contexts. The philosopher Baudrillard talks about the simulated overtaking the real as though it precedes it. There is also a concept in Buckminster Fuller that has to do with the way human behavior impacts other humans. He uses the concept of precession to discuss the effects of our actions on other people. There was all this strange research around the term. That’s some of the sort of density of our starting point. “The Precession” seems to have evolved a lot. What changes have been made over the four years? JM: It’s been quite strange. We started with a residency at Brown University at a gallery in Rhode Island, a little firehouse. We made an initial focus which involved both the projection of real-time text and performers looking at this form called the Living Newspaper, a 1930s style of theater funded by Roosevelt’s Works Progress Administration, which was designed to create jobs and also work theater and the arts, which now seems remarkable. These were socially-oriented plays designed to raise awareness around the economic plight of the farmer, for instance, and health epidemics like the syphilis epidemic. So we were looking at those sources, and we got an invitation to make a piece for the Museum of Contemporary Art in Chicago. We developed, based on the Living Newspaper, a work where people were behaving as them. So instead of talking to the concerns of the 30s, they were channeling, through earbuds connected to mobile phones, texts from social networks where people were talking about different contemporary concerns they had. They were acting as puppets, in a way, by receiving texts and speaking them. That piece was called “The Living Newspaper,” but part of The Hoover Dam memorial is these two winged 32 ft. tall figures that are seated within the celestial map so at some point these Living Newspaper people transform into that image with these massive wings. That was another piece where we started to develop — how do we put the real-time stuff that happens onscreen? How do we put that into people’s mouths and bodies? Then later on we did another piece for the Museum of Contemporary Art, and we used that piece to develop another further component that would ultimately become “The Precession.” In this one, we interviewed museum visitors about their labor histories. We had them teach us gestures from their occupations and worked with a group of 10 male dancers to develop a choreography out of the interviews. But returning again to the original celestial map at the site, the dancers’ positions within the choreography are determined by a map of the position of the stars over the building. This piece was mainly a choreographic piece where the dancers are both building and responding to this database of data gestures, but they are also being plotted according to the position of the stars. “The Precession” is all of these things mashed up and choreographed together. All of these things are happening simultaneously or through a score, so it’s a very organic process. This piece was based on taking small components to specific places. Then when we got to Hyde Park we had an 80-foot 10-screen façade and giant gallery space we could put everything together and the piece became a 10-screen web browser installation. It’s fairly complicated, really process based, but we think the thematics of it come through to some degree. It sounds like it could be a mess, but I think it creates a very discrete vocabulary and certain kinds of imagery comes through. It sort of becomes a piece of visual art performance that is in some ways its own world and in some way rooted to these references. It’s somewhere between having the source and then no longer needing one. Why do you think this project has been so successful? MJ: Artists are interested in invitation, and in some respects, it’s probably because of the richness of the vocabulary we’ve discovered. We’re creating an exhibition around monumentality, but then what is it do to look at images that are rather discrete versus images that are semi-spectacle? One of the things about being able to work over a long period of time is that you got to let the world affect what you’re seeing. You’ll see the dam flood into the space trying to become a figure in the night sky. It’ll feel like the dam is flooding over this huge territory and landscape. There’s a sense of how those two things come together in a very powerful way. Because we knew we were coming here, we adapted it and wanted to investigate. A contemporary theme in performance art right now is how to make performance an exhibition. There’s a return to performance coming back into gallery spaces, so this is a test in some respect with doing it here for two days. There’s something about occupying and thinking about time and thinking about how to structure work in a museum space rather than a theater space. JM: It’s an environment and in many ways immersive. I think the way we work is that we tap into iconographies that speak to the time we live in now as well as previous times. You get the history that communicates to people on a visual level, not just a logical level. I also think that when you make work that is process driven and evolves over a long period of time and has a specific vocabulary, people tend to interpret it within their own vocabulary or within their own lives, whatever narrative they’re bringing to the piece. It enters into that. With a certain kind of experimental work, people become embedded into the narrative. They may have their own sort of epiphany and they may find something that speaks directly to them. And it may not be some prescribed meaning that we’ve created, but it’s chance. Something we’ve noticed over many years is that people tend to get other things from the piece because they’re projecting onto the space, so it’s that network of the individual’s narrative patterns. The audience doesn’t always meet the narrative pattern we’re constructing, and I think these strange conjunctions happen, just in the sense that they’re open to creating your own reading. Not so much that you generate them, just so much that you have them. “The Precession” was curated by Angela Ellsworth, with support from the ASU School of Art, Live Art Platform and Live Art Club. Entry filed under: Art + Performance, Art Events, Art Trips, Artists at the Museum, ASU Art Museum, ASU Art Museum Press, ASU Art Museum special events, ASU Art Museum: Behind-the-scenes, People at ASU Art Museum, Random Acts of Art, Re-Thinking, Uncategorized. Tags: Arizona State University, Arizona State University Art Museum, art, artist, artists, Artists at the Museum, ASU, ASU Art Museum, ASU School of Art, Baudrillard, behind the scenes, Brown University, Buckminster Fuller, Chicago, community, event, Franklin D. Roosevelt, free, gallery, Hoover Dam, Hyde Park Art Center, Judd Morrissey, Living Newspaper, Mark Jeffery, Mary Richardson, museum, Museum of Contemporary Art Chicago, New Deal, non-profit, Obama, photos, Polaris, project, Rhode Island, students, The Precession, travel, Vaga, Works Progress Administration.